Former TYPE O NEGATIVE members formed the band A PALE HORSE NAMED DEATH in 2009. They finally released their first album in “And Hell Will Follow Me” followed by “Lay My Soul To Waste” in 2013 and finally “When the World Becomes Undone” in 2019. So far I have enjoyed what I have heard, but I do have to say it is different than what I had expected. I was thinking that I was gonna get basically TYPE O NEGATIVE without Peter Steele, but that is far from the case. This album is Goth/Doom with a nice dash of hypnotizing melodic sections. Every second that passes on the album, it seems to get better and better. 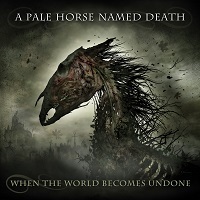 So let’s get going on our quest through A PALE HORSE NAMED DEATHS’ “When the World Becomes Undone”. The first track is an intro named “As it Begins” which is very eerie with bells, chanting as well as someone crying in the background. This is a wonderful intro that sets the mood for this Goth/Doom album. And then begins the title track “When the World Becomes Undone”. It reminds me of a very sad sounding lullaby. The Drums played by Johnny Kelly immediately grab my attention as soon as they kick in as well as the vocals laid out by Sal Abruscato, who is also one of three guitarists. The third track entitled “Love the Ones You Hate” is really damn good and keeps the mood of the album going strong. This one is kind of poppy as far as Goth/Doom goes but it really fits. “Fell In My Hole” is the next song up and I absolutely love it especially the guitars played by the other two guitarists Eddie Heedles and Joe Taylor. Another stand out instrument on this track is the bass played by Eric Morgan. This beautifully written song really takes me back but also hits me with a sense of renewal. There is a nice creepy little instrumental named “Succumbing to the Event Horizon” that leads into the next song. “Vultures” is absolutely astonishing and one of my favorites off the album. This song gives off a bit of an angry feel to me and is a little more energetic than the previous songs on the album. The next song up is “End of Days” which reminds me of SOUNDGARDEN if they were darker and more depressing. This song will most likely be one of your favorites as it is mine. Every track on this album is amazing but I would really like to point out the song “Dreams of the End” which also happens to be the longest song at a little over seven minutes. This song is one hundred percent the best song on the album. It truly represents the Goth/Doom genres perfectly. This is one song I will be listening for some time to come for sure. I thoroughly enjoyed every last second of this and I really think most of you will too.